Hilarious Israeli T-Shirt made of High-Quality Cotton. 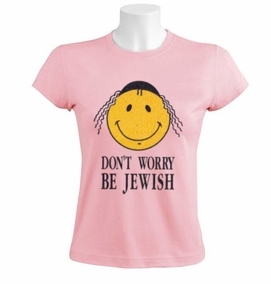 On Front, an orthodox Jewish smiley face with the funny slogan "Don't Worry Be Jewish!" Our t-shirts are made of 100% cotton and are long lasting with bright colors. Our products are all designed and printed in Israel.